Wasps like yellow-jackets and hornets can sting over and over again. But bees can only sting once. We answer a listener’s question about bee stings. Why do bees die when they sting you? A bee’s stinger is made of two shafts, lined with barbs like fishhooks. When a bee stings, it can’t pull the barbed stinger back out. It leaves behind not only the stinger, but also part of its digestive tract, plus muscles and nerves. This massive abdominal rupture is what kills the bee. But there’s an advantage for the bees in this. Even after you swat the bee away, a cluster of nerve cells coordinates the muscles of the stinger left behind. The barbed shafts rub back and forth, digging deeper into your skin. Muscular valves pump toxins from an attached venom sac, and deliver it to the wound — for several minutes after the bee is gone. You might’ve heard people say you should flick off the stinger, or scrape it, rather than pinch it off. But since the stinger continues to work after the bee is gone, it’s only essential that you remove it quickly. And although an individual bee dies when it stings, this makes sense from an evolutionary perspective. Since bees that defend the hive don’t reproduce, the only way they can insure their genes are passed on is by protecting the hive and their reproductive relatives inside. Snodgrass, R.E. Anatomy of the Honey Bee. Ithaca: Comstock Publishing Associates, 1956 Winston, M. L. The Biology of the Honey Bee. Cambridge: Harvard University Press, 1987. When a bee stings you, it also gives off a mixture of alarm pheromones from a gland near the sting chamber. These pheromones excite the other bees in the hive, who will open their mandibles, protract their stingers, and sting anything that moves close to them. Some recent scientific research has indicated that bee venom has a therapeutic effect. Anecdotal evidence points to the lessening of pain in inflammatory diseases like arthritis. One theory is that the injection of a significant amount of bee venom actually exhausts the tissue of its inflammatory response capability. The effect is to reduce the inflammation caused by the disease. 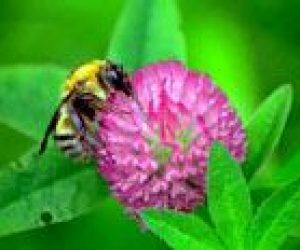 Bee venom also has been shown to have antimicrobial properties. Certain types of bacteria are actually killed by bee venom, and just recently, scientists took advantage of bee venom’s detergent-like properties to amplify the effectiveness of antibiotics. Dr. Lorraine Mulfinger and her colleagues found that bee venom is a good synergistic agent for antibiotic treatment, because it helps the medicine get into the bacteria. The process of leaving behind a body part as a form of defense, in this case, part of the abdomen, is called autotomy. Other examples in the animal kingdom include lizards dropping their tails and crabs leaving their claws behind when they’re threatened. Other stinging insects, like yellowjackets and hornets, don’t die when they sting you. These insects have a special sheath that slides over the barbed stinger and disengages the hooks. It’s possible that these wasps benefit less than bees do from suicide defense, because their relatively inaccessible, honey-less nests aren’t attacked as often. Or perhaps they’re faster fliers and more likely to evade a swat during a sting attack.